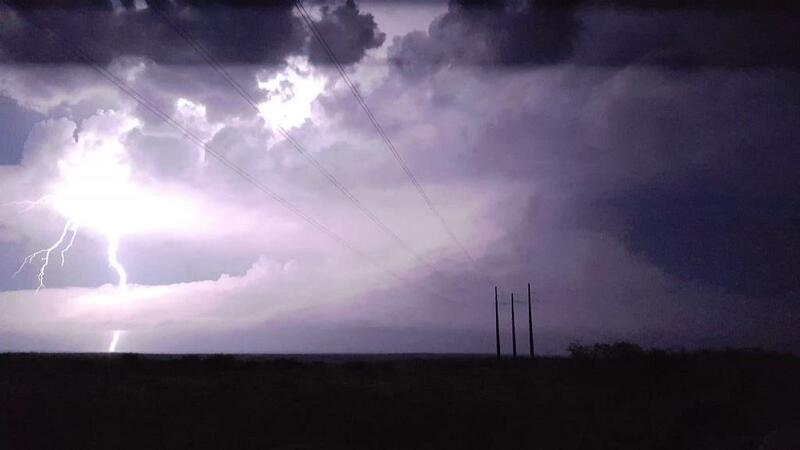 For the 3rd consecutive day, a chase that seemed like it would end in a bust that ended up with a big bang! There were two distinct possibilities for targets today: east near Woodward, OK, or to our south from our starting point in Amarillo, down near Lubbock wherever the outflow boundary from early morning convection intersected with the dry line. Problem was, the two targets were far enough apart that playing in the middle risked being late for either show. We huddled up, watched one last model run, and decided to head south. We made good time from Amarillo down to Lubbock and stopped there for lunch. There were already cumulus congestus all along the dry line, so we were hopeful something would pop between Lubbock and Midland before long and decided to relocate to our southeast, heading to Post. We stopped there for an hour or two as storms tried to bubble up, then died, then bubbled again, then died. 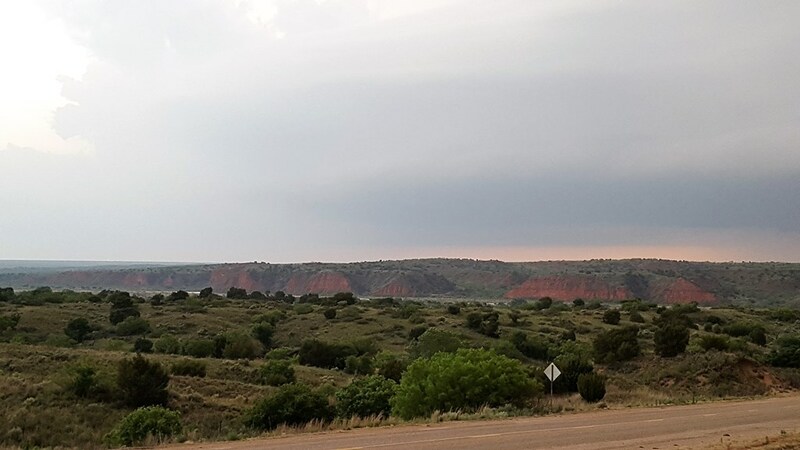 We decided to inch our way farther south, heading out on FM669 on the way to Gail, stopping in the beautiful terrain just off the cap rock and waiting again as storms tried to go but just couldn’t get their acts together. After another long period a storm finally got going over Lubbock and we charged north to intercept, heading up to Floydada. We got there to find the shriveling updraft of our severe, but clearly dying, storm. To our north, just some junky storms, to our south, nothing until you got way down around the Mexican border. We eventually decided to head north with the cluster and drove through some decent sized hail near South Plains on the way up Rt. 207 towards Silverton. At this point we were about ready to give up for the day, but one cell northeast of us started looking beefier, so we decided to go after it, and soon it was severe warned as we skirted the rear flank core and got around to the south, noting a large amount of hail in the fields around us of up to golf ball size. 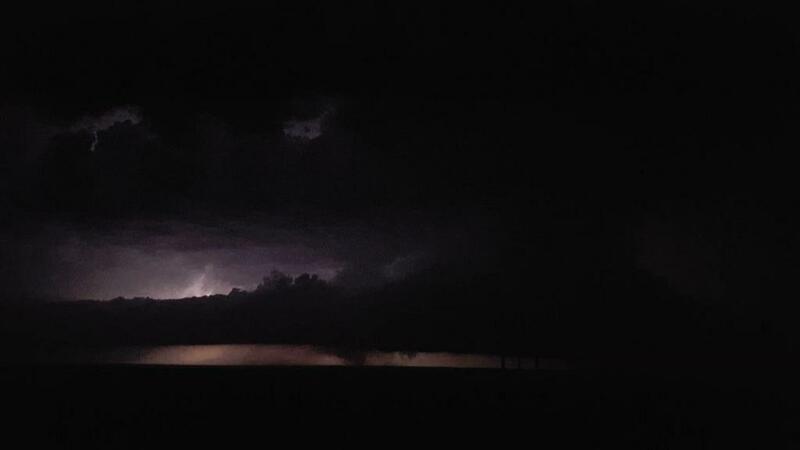 We passed through Quitaque as the storm began displaying rotation just north of us and a wall cloud began to develop. 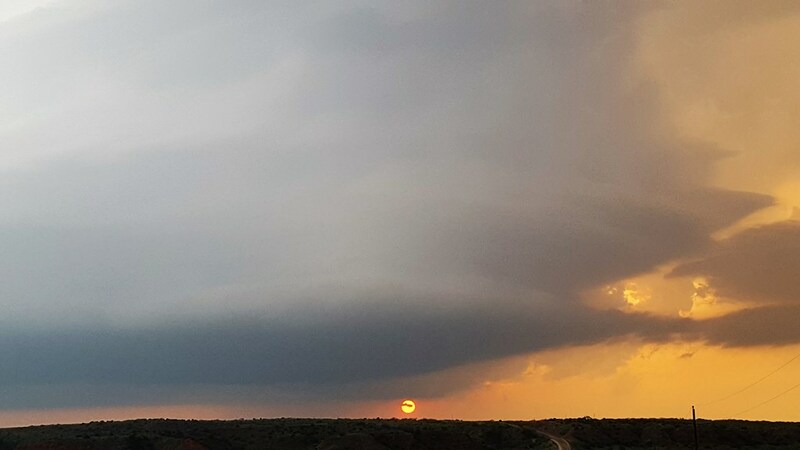 We stopped west of Turkey to see jaw-dropping structure in the storm! 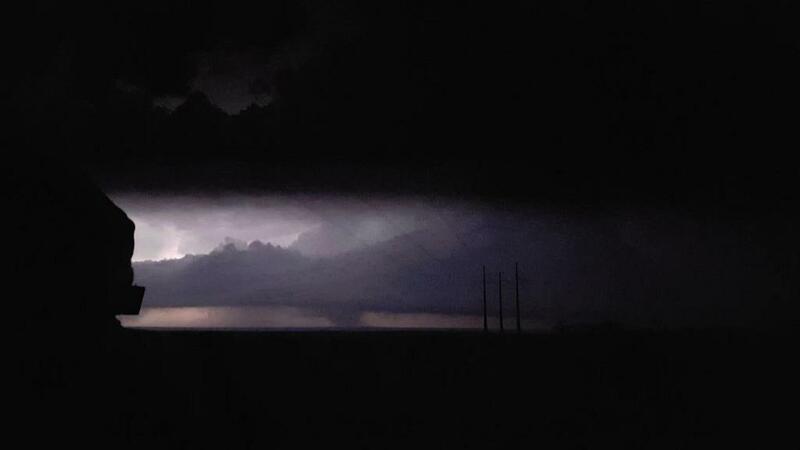 It was a tall soda can, striated to the top, and with a well-defined wall cloud churning away at the base. It looked like it could tornado any time so we waited and watched. The structure was so tremendous it didn’t seem to matter to anyone that they were getting bonked repeatedly by hail of quarter size or larger, but once it reached golf balls again, we packed up the vans and passed through Turkey to the north side of town. There again, the structure was breathtaking and we paused for a few minutes to enjoy before we had to move to stay in front of the storm, which was right turning to the south. We blasted south out of town on FM656 staying well ahead of the storm, and soon were far enough away to really take in all of the majesty of the storm: A big striated barber pole spinning hard all the way up the updraft, with hail streaks pouring out of the front flank core to our north and cloud to ground lightning again crashing all around. To add to the beauty: The setting Sun dropping behind the base of the storm, giving it all an orange hue. 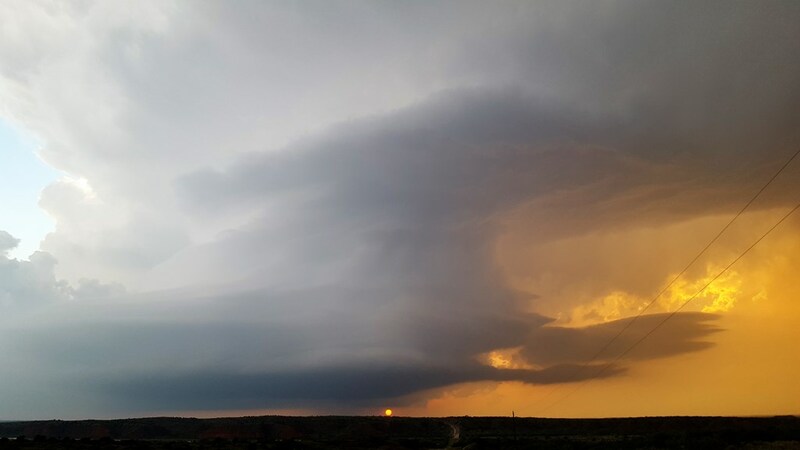 We turned south on FM94 and stopped somewhere about halfway to Matador in the middle of the scrublands and watched as the storm approached us at dusk with the mesocyclone slowly nearing from the northwest. Again, amazing structure! 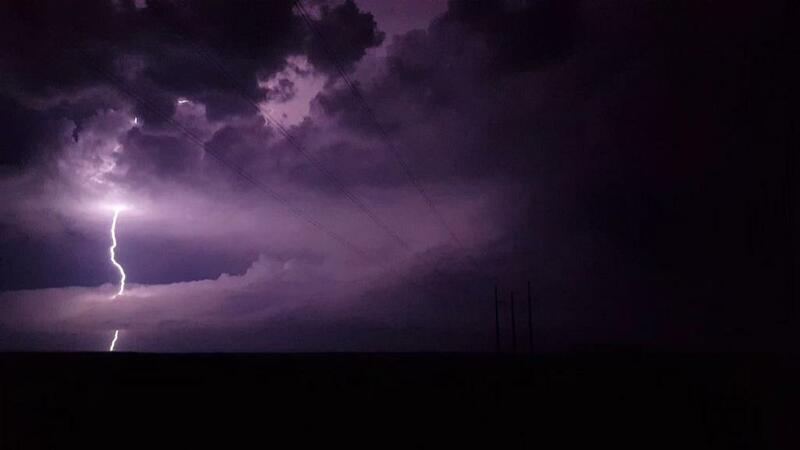 The show for the moment was the lightning blasting all around, and all around the updraft of another left moving supercell to our south that was coming up to collide with ours. 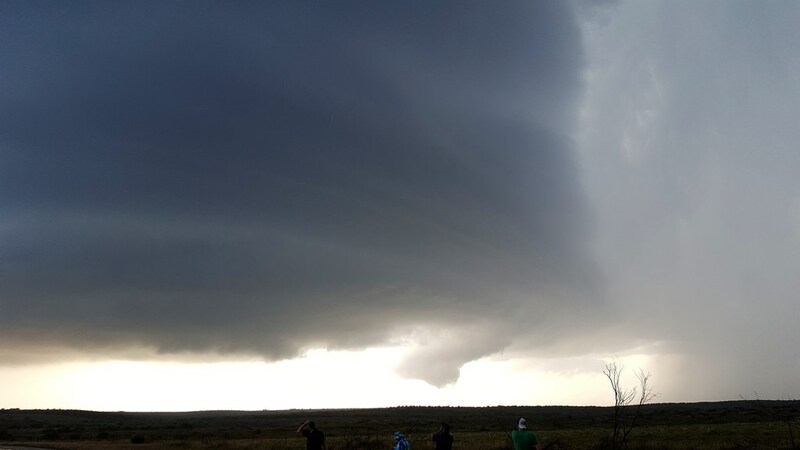 As the storm got closer, the lowering crept nearer the ground and the storm was tornado warned. Miles for the day: 553. We headed south to Gail and storms popped up and down the dry line, but all of them fizzled and died making for a frustrating chase day. 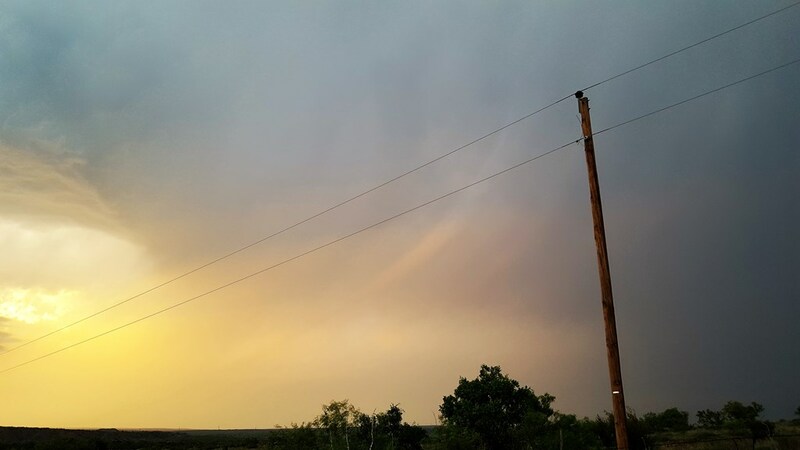 We eventually gave up on the southern storms and headed up to a cluster of storms near Floydada, but once we got there, we arrived to see our updraft withering away. The storm to our north, developing a large, flat base. Clear signs of rotation in the striated updraft, with a distinct lowering off in the distance. A closer look, maybe a little funnel there.. Occasionally getting bonked by golfball-sized hail, we headed out of Turkey to stay with the storm, which looked like it had strong tornado potential. Here the updraft is passing almost directly over us. We headed south and east on farm to market roads to get out in front. 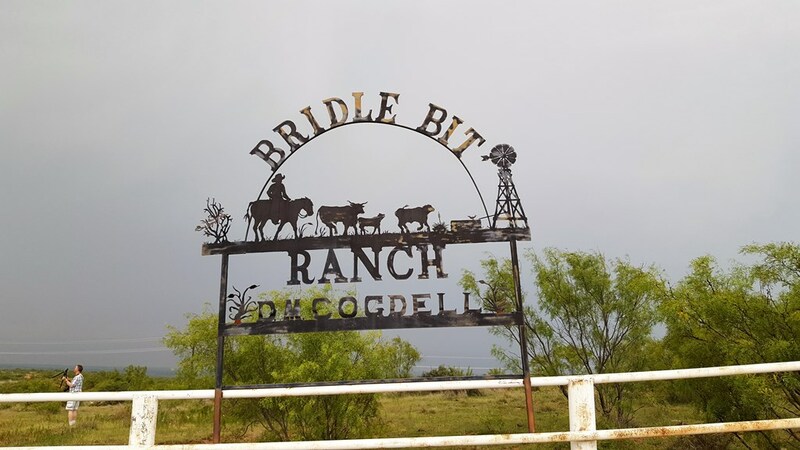 Somewhere out on FTM 656, we had to stop to look at the spectacular revolving storm The Bridal Bit Ranch was as good a place as any. Classic barber-pole just to our northwest. Looking up the updraft to the anvil. Vault area. Striated updraft rotating like crazy. Later we got way out in front of the storm west of Northfield and watched the fantastic structure with the Sun setting behind it. Rain / hail shaft just off to our north. The setting Sun peeking out at the base of the storm. Closer view of the setting Sun. Wider view of the Sunset under the storm. Texas scrubland terrain. Not much water in that river. 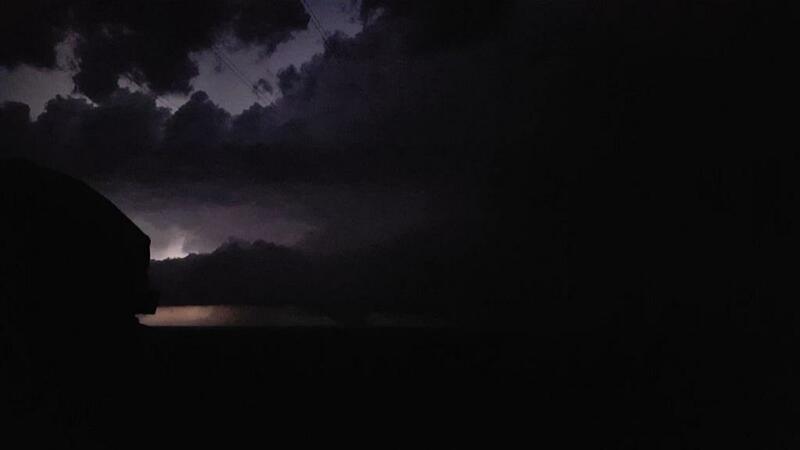 Heading south on FTM 94 near Northfield, we stopped again just before dark to watch the storm really cranking up. At this point the storm was also highly electrified. Meanwhile, to our south, a left-mover from the split of another storm closing in on us quickly. We were concerned about getting sandwiched between the two. This storm was also giving us a great lightning show. 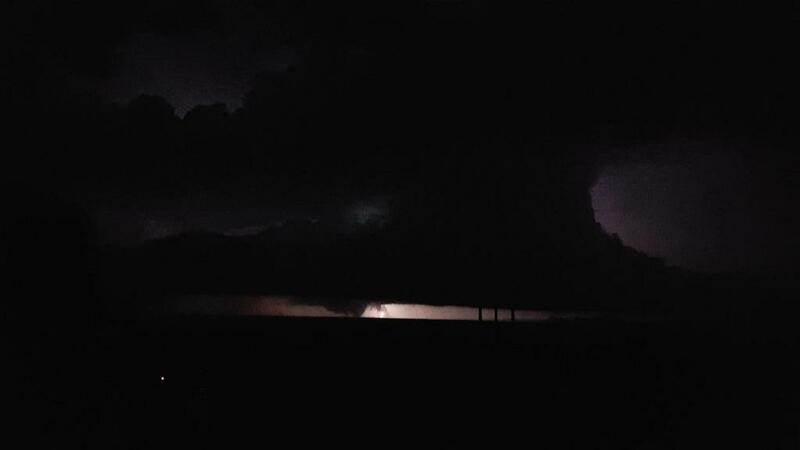 Tornado west of Northfield! 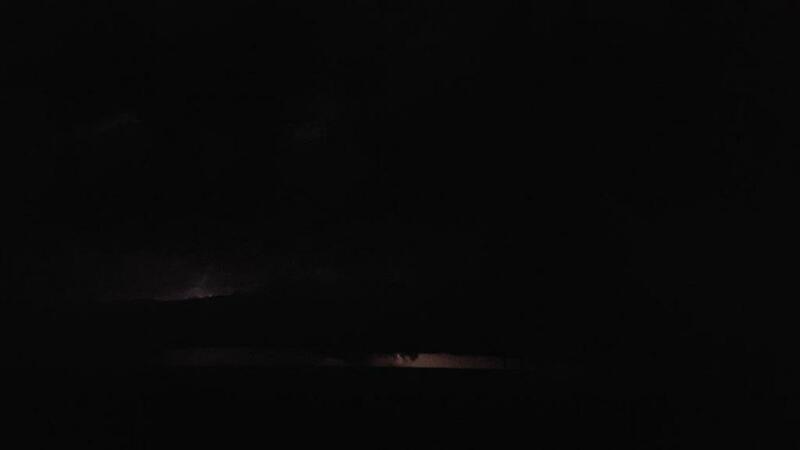 Video still of the lightning-illuminated updraft with tornado below it. A little later as the storm is now to our northeast. The tornado looks to have gotten wider.  Lightning shows that the tornado is definitely still there! Power flash as the tornado hits something. 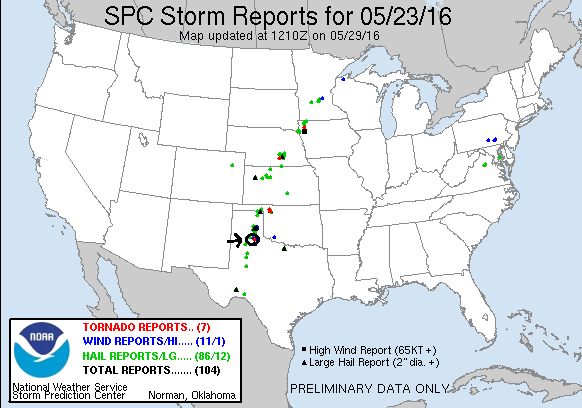 The tornado ended up being rated an EF-3, with winds of at least 136 mph. Long inflow band streaming off to the east. Close cloud to ground strike! 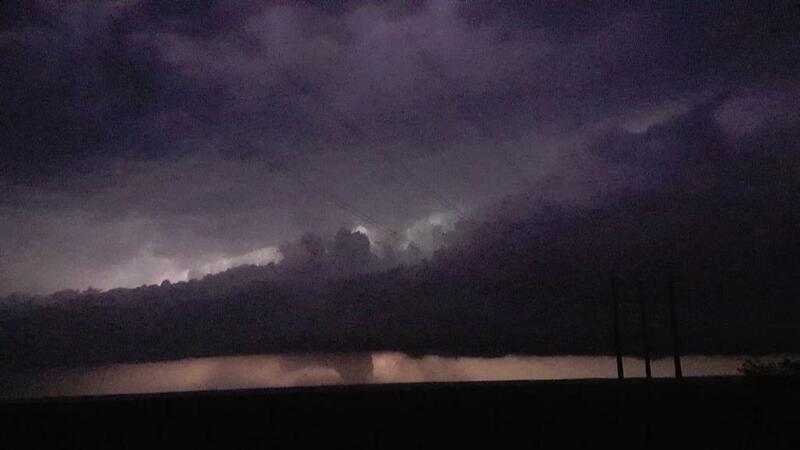 Scud rising in front of the still present tornado. Later, the storm is a bit closer and zoomed in, big cone tornado still churning! 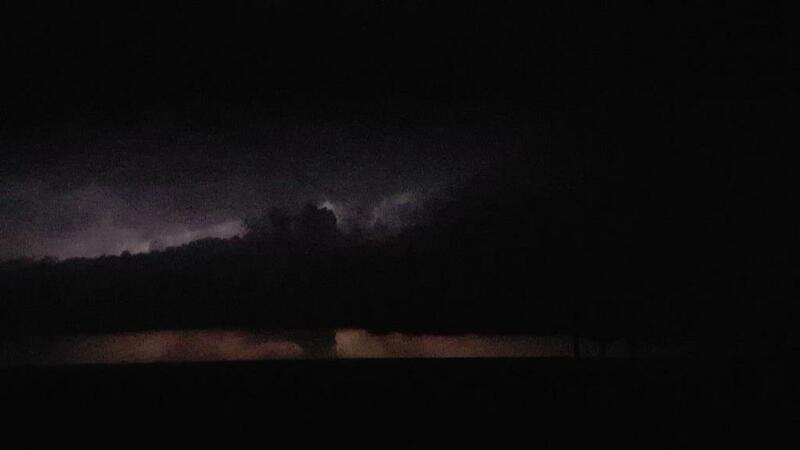 Eventually we decided to call it a night with the left mover closing in on us. We began the LONG late-night trek to Dumas, TX.